Hello! Welcome to Taylored Expressions August Release Day! Today all of the products that we have been previewing are now available in the TE store! The Baker's Dozen has another day of projects highlighting our new stamps and dies! 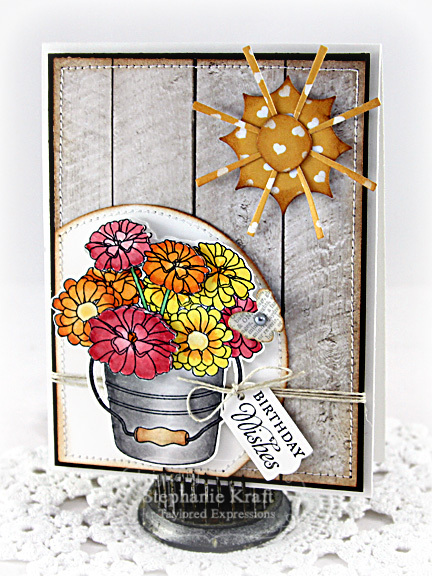 Today I have a card featuring the new Zinnia Bouquet stamp set. It's the latest in the bouquet series, and it's just beautiful! I stamped, colored and cut out the zinnia bouquet, plus a couple of the blossoms a second time, then popped them up on the bouquet. The sun was created using the Build a Scene - Sunshine die. I also added a tiny butterfly using the new Butterfly in the Sky dies. Here's a detail shot. 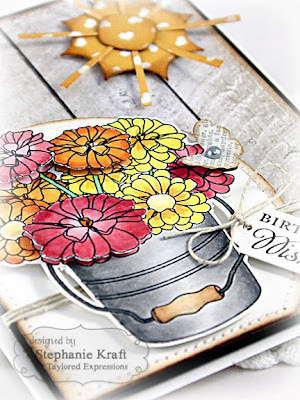 Accessories: Taylored Dies: Build a Scene – Sunshine, Butterfly in the Sky, Designer Mini Tags (Taylored Expressions); Standard Circle Nestabilities – Large (Spellbinders), Markers (Copic), Hemp cord, Silver pearls (Queen & Co), Foam tape, Thread, Sewing machine. LOVE this Stephanie! Your bucket of Zinnias are beautiful. So pretty Stephanie! You did a fabulous job coloring those beautiful flowers! Love the little layered die cut sunshine!